In the latest odd decision to grace the tattooing world, a woman who loves Big Macs has got a Big Mac inked onto her arm. Now, I’m no purist and whoever says tattoos always have to mean something sentimental clearly doesn’t know their mandalas from their irezumi masterpieces. But if you’re a supporter of the sentimental ink, who’s to say the thing you love most in the world and want a memento of to take with you wherever you go isn’t a giant greasy burger? Well, not Coline Touax, for sure. The former McDonald’s employee and self-confessed Big Mac fan, has shown her dedication to the three-layered beef burger and bun combination with a lovely little black and white piece courtesy of Jay Hutton. 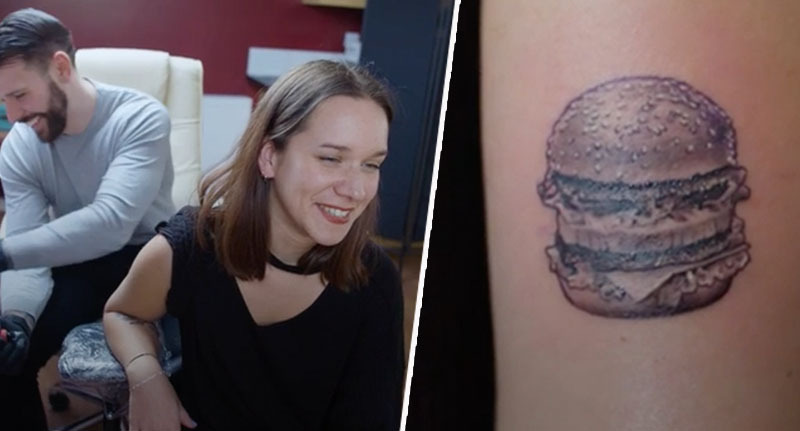 The ex-Tattoo Fixer and celebrity tattooist was set the challenge of capturing the iconic Big Mac burger for the super fan. Would you look at the shading and detail on that seeded bun? Delicious. Most of us wouldn’t turn down a Big Mac – but a tattoo? C’mon, there’s more going on here. Well, McDonald’s has recently changed its recipe for the Big Mac, adding some bacon slices to the tiered treat. Apparently this has sparked some existential crises among fast food fanatics, according to a press release from the nugget and chip purveyors. There are many questions that baffle and perplex us; is it still an empty room if there’s someone it? Is it still priceless if it was free? And now is a Big Mac with bacon, still a Big Mac? This is the first time the iconic Big Mac has been changed in the UK since the burger’s creation in 1968 and opinion is divided on the addition. Big Mac purists are questioning if the burger should even be classed as a Big Mac at all, whilst others are welcoming the new addition in to the Big Mac family with open arms. Join the debate and have your say: #NotABigMac or #StillABigMac. To be honest, I prefer nuggets. They say Coline has got the ink to prove her purist status – and it’s definitely not fake. You’ll notice, in Hutton’s rendering, there isn’t a slice of bacon in sight. Presumably she’s got a life supply in exchange for her efforts? We’ll just file this one under ‘Life is Short’, shall we? The Big Mac Bacon is available in UK restaurants until 19 March, as are the Mac Jr. and the Grand Big Mac.